After issuing the tentative characteristics for oilers, the General Board solicited comments from the various bureaus. This procedure, wherein the proposed characteristics for a new ship were circulated among the bureau chiefs, was used by the board as a method of obtaining a balanced design suitable to each of the bureaus (navigation, ordnance, supplies and accounting, engineering, and construction and repair). Each bureau would respond by way of an "endorsement" taking exception to any provisions that were unacceptable to that bureau and furnishing a recommended alternative. Neither the 15-knot speed nor the 6,000-mile endurance originally proposed by the board (see table 4] were considered acceptable to the Bureau of Construction and Repair, headed by Rear Adm. Emory S. Land. Land was considered by some to be one of the most politically astute officers in the navy.1 The bureau's response to the board's request for comments on characteristics of oilers was transmitted via the "Fifth Endorsement" dated 18 June 1934. Signed by Land, the three-page document recommended that fleet oilers have a sustained sea speed of 161/2 knots (fully loaded), an endurance of 10,000 miles at 161/2 knots, and a cargo capacity of 12,000 tons.2 If adopted, these suggestions would result in a much larger, faster vessel than had been originally contemplated by the General Board. Land's recommendations concerning the speed, endurance, and cargo capacity of the proposed design, given below, summarized the functions and purpose of a wartime fleet oiler while explaining the relationship between cargo capacity, speed, and length. characteristics, be considered a minimum, and that the present requirement be modified to read "At least 10,000 tons cargo, preferably 12,000 tons . . ."
The most suitable speed for a naval oil tanker is intimately associated with the amount of oil to be transported and with the cargo oil capacity of the individual vessel. Other things being equal, the greater the capacity, the greater will be the length of ship adopted. Great length is favorable to maximum speed. Recent investigations indicate that a sea speed as high as 161/2 knots, ship in deep load condition, is obtainable in large tankers of proper design without resort to machinery installations of excessive power. The ability to make such a speed would increase the oil handling capacity and might make for safety in a war zone. When not necessitated by special conditions such a ship could be operated at a lesser speed determined by considerations of economy. Accordingly, it is suggested that the speed requirements read "sustained sea speed, ship loaded, to be 161/2 knots." The difference between a speed of 15 knots and 161/2 knots may not seem large, but speed is a highly critical factor in the design of a vessel. It determines the size of the propulsion system, and to some extent, the amount of fuel that must be carried on long voyages, since fuel consumption varies directly with horsepower. These factors become more acute as speed is increased. As can be seen from table 5, a relatively small increase in ship speed affects the cargo capacity since a greater proportion of the ship's load carry capability--its deadweight tonnage--has to be allocated for storage of more bunker fuel. The modest reduction in cargo capacity that accompanies the addition of bunker capacity increases the direct operating costs of a vessel since less cargo can be carried on a given voyage. Normally, a warship's designer would not be greatly concerned with the operating costs associated with continuous steaming, but Admiral Land was intimately involved in the procurement of funds for the various construction programs and was acutely aware of the budget problems facing the navy. Perhaps Land foresaw the need to finance the construction of naval oilers via the Department of Commerce's loan program. For this to occur, the needed tankers would have to be acceptable for use by commercial operators. In any case, Land queried the industry regarding current design practices concerning the best speed for commercial oilers. He wrote to James E. Moss of the Atlantic Refining Company in January 1935, requesting a copy of its recent study concerning the "operating expenses of large tank ships at various speeds from 12 to 18 knots. "9 Moss responded by preparing a separate report for the navy that "shed considerable light on the problem of designing tankers for both Naval and Merchant Service. "10 His comments concerning the critical issues of a combined design for commercial/naval use provide a useful summary of the problems involved. An abbreviated version of the key points appears below. No particular problem is involved in designing a tanker for universal service [designed to carry any petrochemical product, i.e., crude oil, gasoline, etc.]. Additional boiler capacity required for higher speed by a navy tanker would not be an entirely extra expense on a fast turnaround merchant tanker since the extra boiler might permit cleaning and repair under way. Unless main engines were designed for maximum efficiency at the most economic "merchant ship" speed, the additional fuel cost of operating such a vessel commercially would be very great. Length (h.p.) 487'6" 487'6" 487'6"
 These vessels had nearly identical hull forms. Steaming radius and bunker capacity offer no problem. The analysis to justify the above conclusions was not based on maintaining a constant displacement, as was the case in table 5. Instead, Moss (or his staff) chose to limit the increase in required horsepower by assuming that a finer lines form would be incorporated in the higher speed design. But this would also result in a reduction of the cargo capacity of the vessel (finer lines would lead to a smaller displacement), which would not be acceptable to commercial operators. second major naval program in as many years--CNO Standley resolved to obtain an auxiliary building program legislatively similar to the Vinson-Trammell Act (i.e., one that would provide blanket authority to bring the number of auxiliaries up to strength). In an apparent effort to elicit support for constructing these ships, Standley requested that the General Board "study the Navy's needs in auxiliaries . . . and present a program for [the] yearly procurement including replacement, which [would] bring the Navy to proper strength in [these classes]. "12 The board's report, issued on 16 June 1934, was not particularly helpful. It recommended against building any new auxiliaries at that time, fearing that funds for such ships would be diverted from the construction of major combatants. The General Board believed "that all money available for new construction should be devoted entirely to the construction of the Treaty limited classes." In the board's opinion, the number of auxiliaries in the navy was sufficient "to meet the needs of a treaty navy operated on a peacetime basis." Although it agreed that the navy needed these ships, the General Board opposed the diversion of funds to "minor Combatant vessels" until quotas in the treaty classes had been obtained. The board was reluctant to add the cost of auxiliaries to the treaty building program already authorized since the extra expenditures would only provide ammunition for those in Congress opposed to "preparedness" spending. If the schedule proposed by the General Board in reply to Standley's request was followed, no new auxiliaries would be laid down until 1940!13 As for the aging oilers, construction of the first replacements would not begin until 1942! Included in Swanson's letter was a tentative schedule for laying down or acquiring twenty-three auxiliary ships over a three-year period. 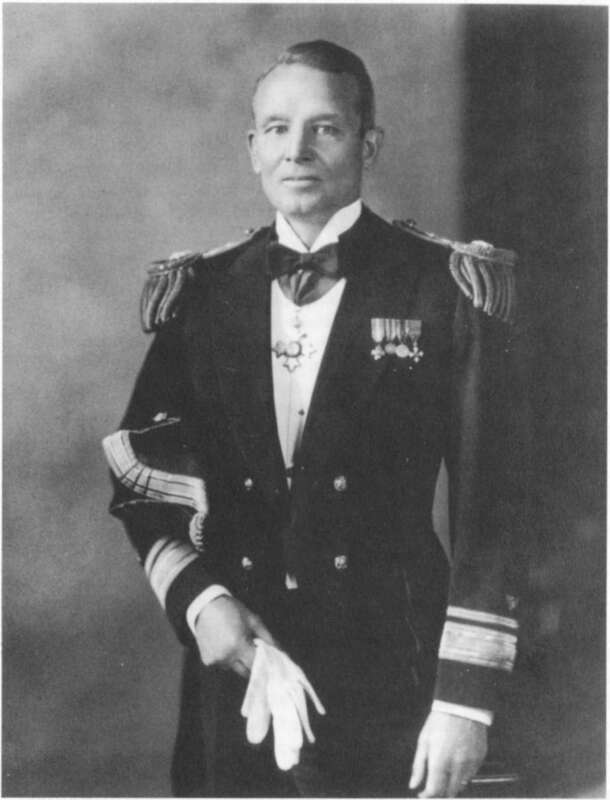 In his letter, Swanson proposed that they be financed with a grant from the Public Works Administration (as had been used to fund the treaty building programs of FY 1934 and 1935), rather than through the navy's regular budget.18 Swanson believed that another allocation from the Public Works Administration would preserve "the desired balance" in the navy's building program and would further increase employment within the shipbuilding industry. After PWA funds were denied, Swanson asked the department (Standley was in London for the second session of preliminary discussions prior to the forthcoming naval conference) to draft an authorization bill along with a list of auxiliaries that were intended for inclusion as part of the navy's regular budget for fiscal year 1936 (calendar year 1 July 1935 through 30 June 1936).20 Drafted on 25 March 1935, it consisted of fifty-four vessels, but for some unknown reason not a single oiler was included in the proposed program.21 Swanson's bill was not enthusiastically received by the Bureau of the Budget's director, Daniel Bell. The navy's regular budget already contained an allotment for treaty construction and Bell was reluctant to approve additional shipbuilding expenditures. He counseled the president against including it in the administration's financial package for the coming year, believing that it was an inopportune time to present such a measure before Congress.22 Roosevelt agreed with this recommendation and the auxiliary bill was quietly dropped from the 1936 budget. With no chance of obtaining funds to build an oiler, the Bureau of Construction and Repair's efforts on tanker design all but stopped. Reeves's remarks must have hit home. Early in 1936, the Navy Department resubmitted a revised auxiliary building program to Congress. Although the program had been reduced to forty-eight vessels, it now included a single oiler.26 With the prospect for funds to build a new oiler in the 1937 budget, the Bureau of Construction and Repair was able to renew its efforts on the design of a high-speed tanker. bureau estimated that a twin-screw installation of 13,000 s.h.p. would be necessary to meet these requirements.33 The Bureau of Construction and Repair, however, could not proceed with the design until the Bureau of Engineering provided details on the engine and power plant that would be selected to fulfill the machinery requirements needed to meet design characteristics. Unfortunately, the Bureau of Engineering was slow getting started. It had done little if any work on the oiler's power plant and did not begin serious design efforts until the middle of December 1936.34 The demise of the auxiliary construction bill for the fiscal year 1937 discouraged the bureau from continuing further work on the design of the new tanker. Additional efforts on the bureau's part would not occur until Congress agreed to authorize construction of a replacement oiler for the fleet. By the time this happened, the U.S. Maritime Commission would be actively lobbying both Congress and the navy in an attempt to take over responsibility for building the tankers desired by the navy. How and why this came about requires an understanding of the Merchant Marine Act of 1936 and the activities of the U.S. Maritime Commission.